Jamestown (JRMC) — Community members young and old are helping bring cancer care to Jamestown. Katie Osbourne and the 20 or so members of the Prairie Pals 4-H Club baked breakfast items and lunches to sell as part of the Stutsman County Gardening Day in May. “I thought of cancer because my grandpa had cancer,” Osbourne said. Harold Osbourne passed away in April. His family gave the option of memorial gifts. One of the choices was the JRMC Cancer Center. That’s because JRMC cared for Harold throughout his journey. He traveled for some tests, however, he received many of his infusions at JRMC. “We were happy for what he could have done here,” Katie said. Most of the students in her 4-H group also are related to or know individuals struggling with cancer. The cause is relatable, she said. “The whole club thought supporting the JRMC Cancer Center was a good idea,” she said. Like the students, Jamestown and the surrounding community are gathering in support of the upcoming JRMC Cancer Center. 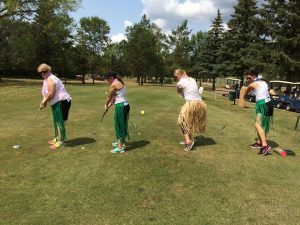 The annual Golf “FORE” Good tournament is set for Friday, July 20. All proceeds benefit Jamestown Regional Medical’s Cancer Center. Each year, the JRMC Cancer Center will provide chemotherapy infusions for more than 100 residents of Jamestown and the surrounding communities. Currently, those people travel more than 100 miles for that care. This will eliminate more than 160,000 miles of travel per year. The JRMC Cancer Center will include six infusion rooms, a consultation area and space for nurses and staff. So far, JRMC Foundation has raised more than $1.2 million of its $1.5 million Phase II goal. Gifts support the buildout of existing space, equipment and technology, staff recruitment and training. This year’s Title Golf “FORE” Good sponsor is the JRMC Auxiliary. The 40 or so members support JRMC through organizing fundraisers and supporting the JRMC Gift Shoppe. Registration is $100 per player and includes an 18-hole golf scramble, bag valet, cart, meals, drinks and swag bag. The tournament kicks off at noon at the Jamestown Country Club. The Hole-in-One is presented by Wilhelm Chevrolet GMC Buick and R.M. Stoudt. Register now to secure your team’s spot. For more information, contact Jackson or Penny Holland at (701) 952-4880 or ljackson@jrmcnd.com. Jamestown Regional Medical Center is located at 2422 20th St. SW, Jamestown, ND and serves approximately 55,000 people in nine counties. JRMC was recognized as a “Top 100 Critical Access Hospital” and a “Best Places to Work in Healthcare” in 2017 and 2018. For more information on services at JRMC, visit www.jrmcnd.com or call 701-952-1050.